Christmas Competition for all on Thursday 28 December !! Do come and join us! If everyone will gather here between 7.30am and 8am we will get the Competition going by 8.30am and it will finish by 1pm just in time for some lovely hot soup, french bread and mince pies!! There are trophies for the senior winner, junior winner, heaviest fish and the lightest fish. It is open to all, it's fun and sociable. A really good antidote to Christmas!! Would love to see you here. just call to book your place. “Just exactly what is there to be jolly about?” I hear a few of you shout. Ahh well, that’s just it in a festive nut-shell is it not? The weather for one has taken a seasonal turn for the better, certainly in regards of the fishing conditions which is something to celebrate at last! The trout are extremely active and fighting hard in all of our three lakes which have been well stocked throughout the summer and autumn months. We have a good, healthy head of fish in various colours: rainbow, brown, golden and blue, with sizes up to 15lb! They are queuing up for the flies and many an angler is being a little caught out and having to come in for a second ticket or an up-grade which we now allow on three and four fish tickets all year round. Another reason to be jolly is the fantastic value five fish shared ticket if you come with a buddy. This allows two anglers to fish together and share a catch of five fish between them, good value and companionable fun. The fourth, new lake is taking shape nicely and starting to fill already with recent rainfall (at last) and water from a discovered spring. This is excellent news and truly a reason to be jolly as it will, in times of hot weather, provide a source of pure, clear water there to keep the Lake to a good level for the comfort of the fish. We have compiled an information board in the lodge to keep all of you up-to-date with the progress. A jolly good reason to be extremely jolly indeed is the prospect of some wonderful fare on offer in the Lodge for groups of angling buddies at Christmas. We can offer a bespoke menu to suit all tastes and pockets. What better way could there be to celebrate this time of year… the fishing at its best… wonderful company amongst friends… and a sumptuous spread in front of a roaring log fire! It’s not too late to call Annie at the Lodge (01323 832615) to book a day out for Christmas or even the New Year. For those of you still pondering what pressy to buy the one you love, then you need look no further! We sell vouchers for fishing tickets and coaching sessions here at Brick Farm. These can be purchased over the phone from the comfort of your armchair and posted to your door. They make an excellent gift for men, women and children alike! We are holding our annual JOLLY Christmas competition on Thursday, 28th December. At a cost of £35 for a three fish contest, including hot soup with French bread, tea, coffee and mince pies it is a wonderful way to clear away the Christmas cobwebs and meet up with fishing friends. Always a popular one this, so call or pop in to book a space ASAP! I hear tell that we are in for a harsh winter this year! I Know, I know! We hear this every year and normally is mild and wet, but indeed, every year since I can remember mum always had her winter store cupboard in place, “just in case”. From about September she diligently gathered cans of soup, dried milk powder, tinned meat, bags of flour and boxes of candles. She hoarded packets of rice and pasta and the freezer was full of mince and chops. She was determined not to get caught out! This no doubt stems from the experience of being trapped in the winter of 1962/3 at Pevensey Bay with her Mother and one year old twins! Many a time I heard the tale of her and Nanna’s efforts to dry 24 terry cotton nappies a day in-front of a dwindling coal fire! Popping down for Christmas turned out to be the understatement of that particular year for sure as she did not make it back to Eastbourne till March! It is almost a shame really but we never had a harsh enough winter to benefit from her hoarding. We spent the rest of the year using it all up until August, just in time for her to begin the pointless process once again. I must say that I’m glad we didn’t ever become trapped at Hubby’s father’s house. The contents of his “winter cupboard” consisted of eighteen jars of pickled onions, a catering box of mint imperials and what can only be described as a consignment of custard creams! When one day when there had been a slight frost and I became a tad anxious, I glimpsed into the freezer I found it full to the brim of bags of fresh tripe from the local kennels for the dog! Mum’s habit of winter hoarding is one I have come to realise recently that I have carried on, albeit in a subconscious manner. It is crazy as there are more 4x4’s in our village than you can shake a stick at and we live right next to the pub, an excellent place, if any to be marooned, just like the new Christmas Waitrose ad by chance! Deep down I wonder if there is a weird sort of desire for us to actually have a harsh, snowy winter for once. Do we miss the seasons? We always used to have a wet and windy spring, followed by a long, dry summer. Autumn was always damp and gloomy or bright and crisp and this was followed by cold, snowy weather in the winter. They often run into each other now, all muddled up together with no discernible difference. What on earth are the trout supposed to do? Ah well, I guess we will have to make the best of it as us British are so acclimatised to doing and go fishing. Over and out now for another month and YEAR! We would like to wish a very happy Christmas and New Year to all our wonderful customers from Annie and Caroline. As you read this report in the middle of November please bear I mind that I am compiling it in the middle of October! A tad tricky at times it has to be said. Indeed, on more than one occasion I must admit to being well and truly caught out, as I’m sure a few eagle-eyed readers were quick to notice! I am thinking in particular today about our wonderful British weather which has a habit of changing at the drop of a hat! Whether it is from… mild south-westerlies to freezing north-easterlies overnight, dry, drought conditions to drenching monsoons in the blink of an eye or balmy tee shirt temperatures to thermal long johns and de-icing the car within 24 hours, it continues to catch out the traveller, gardener or fisherman with a harshness that beggars belief sometimes. They say, “If you don’t like the weather in Britain just wait five minutes!” I myself think this time scale could, in reality, be considerably shortened! Many a time I have had to rush to fetch in the washing, scamper to hide with the dog under a hedgerow, panic to cover the runner beans or having made it as far as the front gate been forced to retreat to the house for a thick jumper! Now that we approach bonfire night I am filled with an unnerving amount of trepidation. We are at that time of the year where anything could and most certainly will happen! I recall in years gone by… standing round the fire to watch the fireworks in, snow and frost, ankle deep in liquid mud in horizontal rain and on other occasions, stripping off layer upon layer I was so hot! We have just narrowly missed the end of the hurricane/tropical storm that the poor folk of Ireland and Scotland have suffered but it could just as easily been us here in the South, remember 1987! It occurred to me that when we are hit by this seasonal “Let’s wait and see what’s chucked at us” changeable weather and mysterious metrological conditions, then what on Earth are the poor trout supposed to do/expect/think? Are they expected to feed up frantically in all layers of the water for the winter, hide under the banks in the shade, shelter in the rushes from the wind? What manner of insect life is likely to be there for them? Is it warm enough for buzzers and damsels? Are Daddy Long Legs going to be blown across a choppy surface for them to chase? Should they take to the depths where the temperature is “just so” and await what drops down in front of them or hatches out from the bottom? All these conundrums for us and fish are decided by the weather! At least we humans have the benefit, albeit unreliable, of the weather forecast! Even then the BBC, ITV and Sky have wildly differing accounts and if you make the mistake of watching all three you are left none the wiser anyway! What more can I say, other than we are in the lap of the Gods. Here at Brick Farm (at the moment) black is definitely back! Sedges are still catching on Well Lake! Blue and red damsels are thick in the air. Hatching buzzers and midges are annoying. Clouds of daddies are rising from the grass. Fry patterns are a must, particularly on Brick Lake. (STOP PRESS>>> a gentleman has just landed a lovely 5lb brown with a black and red Zonker!) The fish are up high and in a “chasing” mood on Stag and Well Lakes and down deep but snatching hard and tricky to hook up on Brick Lake! This may be a good time, (if there is one) to use an indicator! We have no fly or line restrictions here! Dare I mention the dreaded (for some) Christmas! Sorry, but it fast approaching and we need to be ready, unless it is just to be the 24th, 25th and 26th of December bah humbug!! We have vouchers for your loved ones, over the phone if , and what better pressie could there be, other than a week in Barbados! (I am always grateful for a pair of gardening gloves). We can offer a bespoke festive menu throughout December for groups of angling buddies so why not book a day here and enjoy each other’s company, a tasty meal and your beloved sport all together. Okay, over and out now for another month but a word in your shell-likes… One of our trusty regulars has just informed me, from the horses’ mouth so to speak that, according to a radio interview he heard at the start of this year we are in for a biblical winter, one on a par with 1962/3 in fact. All that this old chap predicted has come true so far i.e. a dry spring, a hot June, a summer of good day/bad day, a dry autumn…. Oh dear!!! On a positive note this is when the BIG fish come out to play! This month I will start the report for once, if you’ll forgive me, with the news! The men have arrived this morning (18th September) to begin the construction of our fourth lake here at Brick Farm! A truly historic moment, I’m sure you will agree. For those of you who have not yet seen the aerial plan we have displayed in the Lodge, the site of this new water is to be down in the dip of the valley below Stag Lake and will sit on a more East-Westerly orientation, thus allowing many more sheltered options on a windy day in the spring or winter, or even a British summer! It is to be larger in size than Brick Lake and will have a wildlife island in the middle. With contoured banks for interest, it will have swims to suit the left or right handed angler! 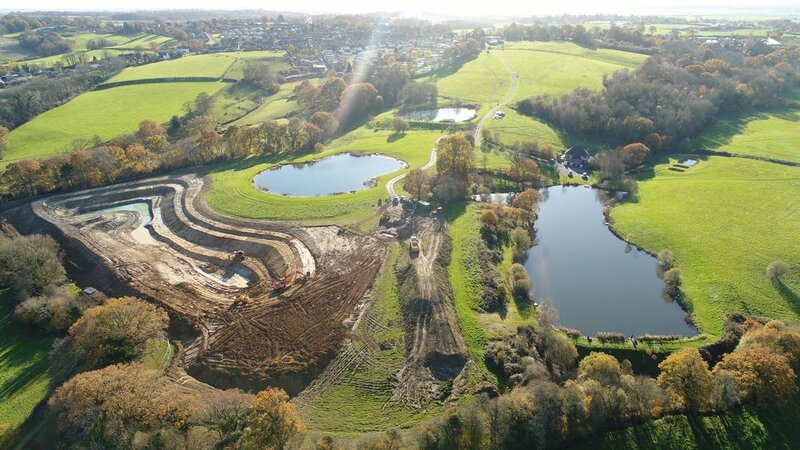 It will be dug to a good depth right round and be filled from the overflowing spring water coming into Well Lake at the top of the fishery, so will remain clear and cold! There will be a track down to it to enable stocking and we intend to provide another railed, double-width platform for those needing wheelchair access. In time there will be mulched, woodchip paths and hardstand fishing swims and a “bus shelter” style hut for shelter from the sudden, unexpected squalls that sometime catch anglers out without a coat and a composting-style toilet for folk caught out in that particular department! If all goes well we expect to be opening it for fishing by this time next year and no doubt will have “a bit of a do” to launch it to our anglers. We will keep you posted! Following the recent rainfall all the lakes are now almost full and the temperatures have dropped to a level for the fish to begin to become active and hungry for some excellent autumn sport. Anglers report hard fighting fish and aggressive takes now and we have recently been able to re stock some beautiful large blues, rainbows and browns for your entertainment. We will continue to stock all lakes weekly. Now that the wonderful autumn months are upon us why not introduce a friend, partner or youngster, (we recommend for the children no younger than the age of 12) to this absorbing, fascinating sport-hobby-way of life? This is the perfect time to enjoy the late sunshine and enjoy the cooling fresh air in our very special piece of the countryside. We can offer tuition and rod/tackle hire and to help you take your first steps to experience this exciting new past-time. If you are a group of angling friends or belong to an angling club why not come for a day’s fly fishing and book a lunch. We can tailor a day to suit all requirements in regard to fishing tickets and menu and in fact this is a good chance to remind all of you that Christmas is fast approaching and we will be offering a festive version to suit all tastes! We offer vouchers for gifts as Christmas presents and these can be purchased for the one you love from the comfort of your armchair via the phone. Just call us at the Lodge on 01323 832615. These vouchers are a popular present for angling partners or friends. A date for your diaries… our Christmas competition this year will be held on Thursday 28th December. We will run this friendly and fun day along the usual lines with a charity raffle and simple but delicious lunch. This is always a popular day following the festivities of the Christmas period and a good day for blowing away the cobwebs. We will be happy to take any names now for an idea of numbers, just call the Lodge. We have had some nice fish landed lately, caught on a number of fly patterns but still leaning towards the more natural, small imitations. Having said that… by the time this is issued the little devils will be taking all sorts of everything I suspect, as they start to instinctively feed up for the winter! As I mentioned, this is a fantastic time of year so why not treat yourself to a six fish ticket and come for a whole day! Over and out now for a period of frantic fishing fun - a time of bonfires and blackberries, log fires and hot chocolate. Beef stews and sloe gin!! I can feel a new selection of flies in the making! Every man should have a shed! I’ve been saying this from the day I got married! Don’t get me wrong, I am very happy with my hubby and we get along just fine – most of the time – but as important and precious as a couples time together might be, our time apart from each other is equally important. Hubby’s dad had it about right; he had seventeen, yes, seventeen sheds of all shapes and sizes on his ground and stayed happily hitched for the best part of fifty years until, sadly, death did them part! When a wife has had a trying day and the man of her life is getting under her feet and becoming a bit annoying as they have a habit of doing, she can say, “Haven’t you got a few jobs you’ve been meaning to do in your shed dear, I need to get on in the house a bit darling” and no offense is taken, no harsh words said and he happily trots off to fix a broken chair or mend the bird table. Equally it works just as well the other way around. When a man needs some “space” from his trouble and strife all he has to do is say, “I’m off down the shed for a while to do some chores, call me when dinner is ready” and again no harm done, no sharp words spoken in anger or malice. In this pleasant, convivial way it is possible to have some “me” time while not upsetting the one you love, a recipe for a successful partnership and happy life together in complete harmony. Believe it or not, time spent fly fishing with a partner is another way to spend both some quality time together or enabling us to find a little of that all-important space we all crave now and again. It is one of those rare sports which women and men can compete, side by side, in total equality. The day can begin at the Lodge with a convivial morning coffee and bacon roll, time to talk tactics together and discuss flies and tippets and lines with each other. Enjoying a good chat with the regulars and a moan about the weather is the traditional way to start a day’s fishing with your dearly beloved side by side. Then you can either: Fish side by side on the bank, following each other round the lakes all day. Perhaps helping to land each other’s fish, untangle each other’s knots, or swap flies. Have some lunch together and admire the view while talking about the family’s problems. Or you can: Each head off to a totally different lake, wave every now and again from a distance and keep your fly choice a secret! Eating your sandwich in a secluded spot, away from everyone else and enjoy total peace and quiet in complete silence, meeting up again only at the end of the day when utterly restored to a state of well-being and gentle countenanceonce more. The choice is yours! We have kept up with the mowing, strimming and weed clearing throughout the last month. Apologies for any noise, but it takes a lot of work this time of year to keep the swims open and the grounds up to scratch, especially as we have recently had some much needed rainfall and everything is growing so fast. We have also removed the troublesome tree from peg 15 on Brick Lake, round in the cove to the right. This tree has been plaguing anglers for years and we finally decided enough was enough! It’s removal will allow this particular area to be fished from both sides, in any wind conditions, thus opening up more possibilities for you all when choosing a spot. We have “closed off” the top parking area for a while. It is now a convenient picnic spot for our anglers, but is still available for Blue Badge holders to park their cars of course! We do need to encourage all anglers to start at and return to the Lodge at the end of their trip to fill in the returns book on both arrival and especially on departure! Even if you are unfortunate and do not catch any fish we DO need to see this recorded in the book to enable us to stock effectively for all your enjoyment. We thank you for your co-operation. Our planning application for a fourth lake has been successful!!! We are aiming to begin to dig this autumn with a view to having it fishable by spring 2018. We will be keeping you informed of the progress of this exciting project as we go and are looking forward to the extra space and angling options this will provide for all of us. As I mentioned last month we did not have time to submit the results or pictures of our “Black and Blue Mystery Pairs Competition” held to raise funds towards the purchase of a Tramper, all terrain mobility buggy for Paul Martin (Chuckles). Our huge thanks go out to all those who in many different ways supported this event. We had a truly marvellous evening and raised more than £3,000, almost half of the funds needed! The results of this unusual Mystery Pairs contest were (1st) Slim Wallace and Matt Dean (2nd) Paul Martin himself and Keith Holford (3rd) Robert Barden and Caroline Cutmore. Extra special thanks must also go to Fulling Mill (Box of flies), Airflo (Fly Lines) and Markerstudy/Bewl Water (Landing Net) who were so kind in generously donating these items for Robert Barden to present to Paul Martin to help to make the day even more memorable for him (especially as he broke his net during the competition!!). Thank you all – a great day became even better! The cooler weather of late has meant we have continued to stock plenty of good quality trout this month. The lake water levels are high and the fish very active, if still a bit “picky” with their food! Smaller natural flies are the best option at the moment. Diawl Bachs, Buzzers, Damsels (small), black spiders and gnats and dry daddies and the like are fooling the little devils. The most important tactics at the moment are: MOVE about, ASK advice and COVER the margins! We have seen some lovely fish landed and heard many tales of the ones that got away!! Never mind, there’s always another day! Over and out now, tight lines from Annie and me for the wonderful month of September. This is my personal favourite time of the year. A great time to be out in the fresh air with a rod in your hand! Very special request for support and fun ......................!!!! Recently one of our regular young anglers was involved in a car accident which resulted in life changing injuries – but this did not change his enthusiasm to come fly-fishing!! I would like to invite you to come and take part in a light-hearted fun fund-raising Mystery Pairs Competition on the evening of Sunday 30 July 2017 and to pick up a form to get yourselves sponsored for £s (or pence, but preferably £s!) per fish for this ‘3-Fish ticket per angler’ event. All the funds raised at this event will go directly to the fund the aim of which is to collect sufficient funds to purchase a all-terrain off-road mobility scooter for Paul. Let’s see just how much we can raise to kick the fund off and help to get Paul off-road just as soon as possible ????? So come and join us for the ……. Ok… it is now officially, according to the MET office, the start of summer… so what do we get chucked at us? The worst storm and wild weather to hit the South East since the storm of 6th June 1870 which apparently cost the life of Thomas Pierce and presumably many other sailors “in sight of home” according to the memorial plaque in the church yard in Pevensey. When I read the words etched on it a while ago I did a double take, the 6th of June by chance is our birthday, and my identical twin sister and I (Yes, sorry, I know it’s hard to take in but there are indeed two of us!) growing up, were always blessed with wonderful weather for our Big Day. Surely at the start of a British summer we could never have had such terrible storm force winds. Perhaps the engraver made some awful mistake and suffered a severe slip of his chisel when he was working and this terrible tragedy really happened in January, his mistake going unnoticed for 147 years. I know, highly unlikely! While I stood and pondered at the time, I tried to imagine what particular set of strange meteorological, astrological or even mystical circumstances had come together on this particular June 6th. The poor sods must have set sail full of confidence for an easy passage up the Channel, maybe finding time for a spot of sunbathing on deck, perhaps planning a little fishing en route or even a chance to drop anchor and indulge in some skinny dipping to cool off in the summer heat but no, instead they were tossed and battered by a cruel sea never to see land or loved ones again! A complete freak of bad luck I decided, a colossal, unfortunate, miss-alignment of the stars, a coming together of special, never to be repeated conditions weather-wise that they could not have predicted. Well how wrong was I! Suffice to say my Big Day this year was spent not at all how I had intended. No fishing trip as planned and no grilled trout on the BBQ for supper! I spent the day wondering if the electricity was about to switch off, listening to the howling gale and watching my lovely roses being totally wrecked! The garden was being shredded before my eyes and my freshly planted oriental foxglove can unfortunately testify to this. I suppose it could have been worse… I could have been out at sea! The weather will improve, the winds will calm down and we will be able to return to our fly fishing and enjoy the summer again. Although the fish are becoming a bit on the picky side in regard to the normal flies, this time of year finds us dusting off our dry fly imitations and trying new tactics to fool the little devils. There is never a better time to take a stroll round the lakes here at Brick Farm and keep your eyes open for those tell-tale signs of activity on the surface or in the close margins and get a good “feel” for the water before choosing a spot to fish. There is never such a good time to seek advice and pick the brains of regulars or with us in the lodge with regards to recent “hot spots” or flies of the moment. There is also never such a good time to make full use of your day ticket, starting as soon as we open the gate, (7.30am) fishing for those first key hours in the day while the sun is lower in the sky and then perhaps, if distance allows, popping home for a break in the heat of the mid-day and returning later in the afternoon to catch the end of the day as the sun drops. If you live too far away for this then why not bring a picnic and enjoy a shady spot for a while. Just being outdoors at this time of year is a pleasure all by its self we wait all winter for, so let’s make the most of it! Unlike some other fisheries, we continue to stock regularly throughout the summer months so there is every chance to catch your bag, it may take a little longer than normal but that is all part of the fun! Trying new tactics and different swims, using different flies or teams of flies, (no restrictions here at Brick Farm) is all part and parcel of fly fishing at this time of year. I personally have dozens of small winged and hackled wet flies I have never used and I have decided that this is the time to steer away from the old Cat’s Whisker or fritz lure and work my way through this assortment for my next few trips. Here at Brick Farm Lakes we have a wonderful Lodge for you to enjoy. We provide complimentary tea and coffee for our anglers and at this time of the year cold water and squash are on the counter. Guests are free to sit and enjoy the beautiful view from the deck area. We would like to remind you however, as we approach the holiday season that … dogs are not allowed around the lakes and obviously best not left in cars and only children fishing properly on a one to one basis with an adult are permitted around the lakes, for safety reasons and for the enjoyment of all anglers toddlers are not permitted around the lakes at any time. Here we have clean toilet facilities and if I may say these are I’m sure, as important to men as to us ladies! I had reason to really consider very hard weather I returned to a certain fishery I visited recently. Although the fishing was good and the setting beautiful the lavatory left a lot to be desired, the scrap of soap was disgusting, the toilet had not been cleaned in days if not weeks and as for the towel on which we were supposed to wipe our hands, well let’s just say that I seriously doubt if any self- respecting house elf would have even considered wrapping himself in it! This is not good enough in this day and age. We fisheries are constantly being encouraged to promote our beloved sport to the young, the elderly and the disabled. We are expected to provide beginner days, casting schools, charity events and the like and, whilst I know that some fisheries are set deep in the middle of the countryside, to have clean toilet facilities are essential and the very minimum for an up-to-date 21st century business. We have had some wonderful fish caught in the last month. Some stunning Rainbows have fallen to the skilled hands of our lucky anglers. The fish are fighting hard and in fin perfect condition so well done to all of them and there are plenty more left out there for everyone! Over and out now … tight lines for a… I-haven’t-used-this-before-let’s-try-anything-and everything summer.